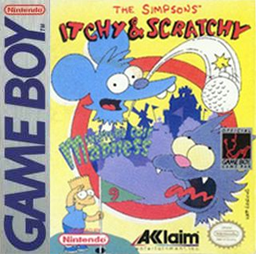 Itchy & Scratchy in Miniature Golf Madness is a Miniature Golf game released on Game Boy in November 1994. It features Itchy and Scratchy. The player takes control of Scratchy as he plays through mini golf courses, trying to achieve a low score, while at the same time avoiding Itchy's attacks. Itchy uses weapons to attack Scratchy. Scratchy can acquire items and power-ups to defend himself against Itchy. He can also use the putter as a weapon. There are a total of nine holes in the game. Critics gave Itchy & Scratchy in Miniature Golf Madness mixed to positive reviews. Nintendo Power gave it a 2.825/5 rating in their August 1994 issue. In February 1995, VideoGames & Computer Entertainment wrote that "You'll never know just how fun miniature golf can be until you play this Itchy and Scratchy game. The unique gameplay sets it apart from other platform games. You get a golf game and an action game all in one." The magazine gave Miniature Golf Madness a 9 out of 10 rating. GamePro rated the game 3/5, commenting that "It's funny, but this routine game's not much fun." ↑ Itchy & Scratchy Golf Reviews. GameSpot. Retrieved on 2010-07-31. ↑ 2.0 2.1 Itchy & Scratchy in Miniature Golf Madness. MobyGames. Retrieved on 2010-07-31. Modified on September 22, 2015, at 07:22.